What is art? It’s doing something really well. I like that. In another post he talks about the Isaac Newton idea of ‘standing on the shoulders of giants’ – learning from the greats that go before you. But more than that, he talks about finding the artists who are trading the same path as you – your fellow travellers. The idea that as artists we are not alone in our direction and that there are others going the same way – and instead of looking at them as competitors they should be seen as companions. THis week I found myself in the presence of my giants. 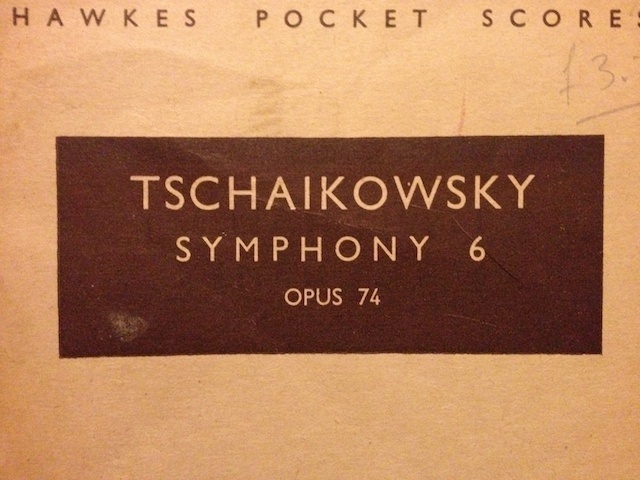 I went to Germany to see a work by Christo and earlier today I played in my all time favourite piece of orchestral music – Tchaikovsky’s 6th Symphony. To most this probably doesn’t seem as much a deal as it was to me. I can’t express how significant both are to where I am now. First up I travelled to Oberhausen in the Ruhr Valley in Germany (armed with my trusty Leica and virtual rolls of Ilford HP5plus) to see ‘Big Air Package’-. 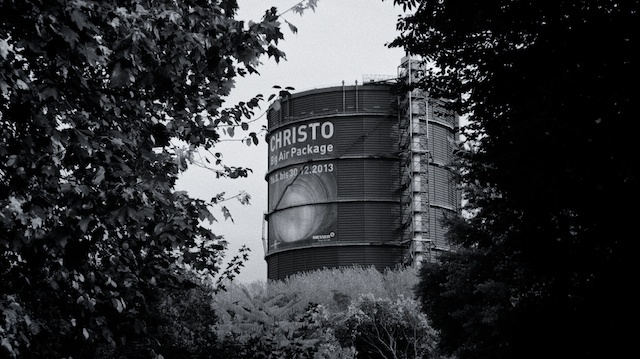 This piece is unusual for a Christo piece as it is inside, and also it’s been up since May. However, despite admiring all his work for years and all the apparent similarities between his and my work, I’d never actually seen any in real life. The Gasometer in Oberhausen, at around 100m tall, is now the largest space dedicated to showing art in Europe – bigger than both the Tate’s Turbine Hall, and Paris’ Grande Palais. Within that huge, post industrial space, Christo has created one of the largest single works of art. Standing at over 90m high, ‘Big Air Package’ does exactly what it says on the tin – it’s a big parcel of air wrapped up in PU-coated nylon (the same material I used for my Paviljong in Sweden last month) and bound with rope. The entire piece is kept up purely by a volume of air pumped in by constant fans. It’s not a new idea – he made a number of ‘Air Packages’ back in the 60’s – the largest at Documenta ’68 took two large cranes to install and three abortive attempts to get the engineering right. The piece in Oberhausen is over 30 time the volume of that previous package. 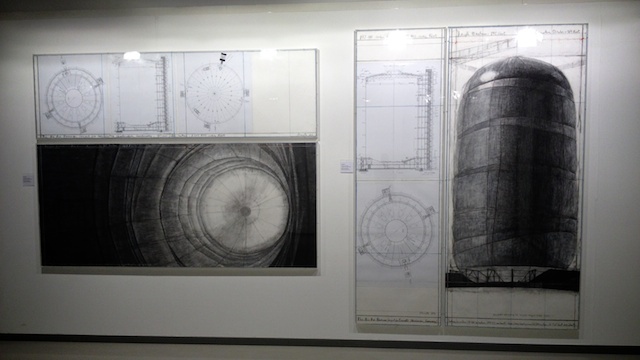 To me the interesting bit was how the piece filled the entire volume of the space in the Gasometer. I’ve been looking to do a piece that works on a similar level for a few years now, but so far none have managed to happen yet. 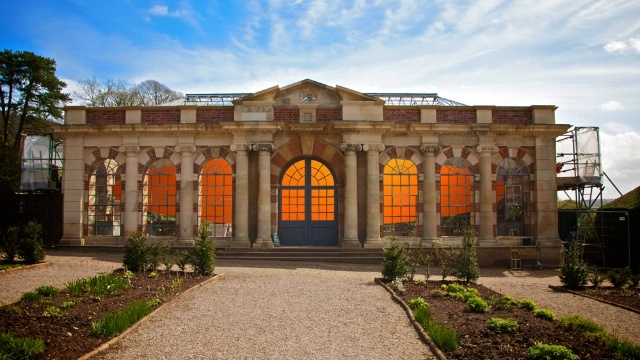 The first was for a castle in Lancashire, the second for a victorian greenhouse in the southwest. For now they’re both on my ‘to be realised’ list and sure they will happen so long as I keep thinking they’re a good idea. So it was good to see a piece like that realised. Of course, this was much much larger than any I’d planned to do. 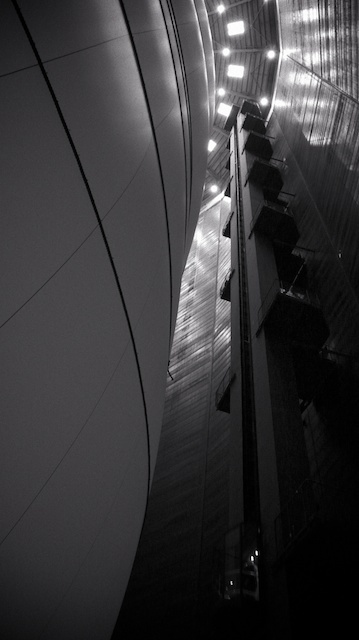 How many artworks have you been to recently where you can go up the side of it in a lift? The volume inside was just as impressive. A vast white cathedral space. Very Kubrick. Very Turrel. 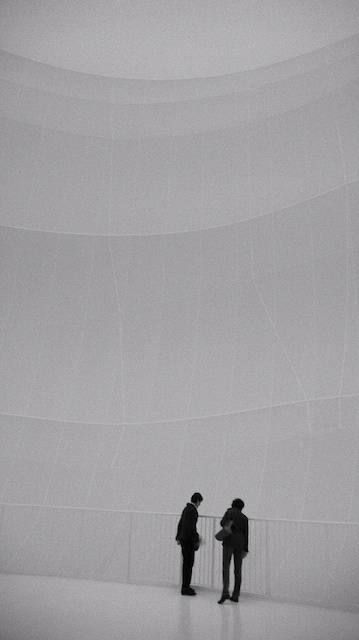 But the whole experience bit was all very Christo. Down the road in the Ludwiggalerie at Oberhausen Schloss, there was a small exhibition of the original drawings and models of the ‘Big Air Package’. Uniquely, Christo funds all his large works entirely through the sale of preparatory drawings and models. It’s an elegant business model which I think I’ve written about before. Again, I’d seen pictures of these works on paper in books and on video but I’d never seen the real things. 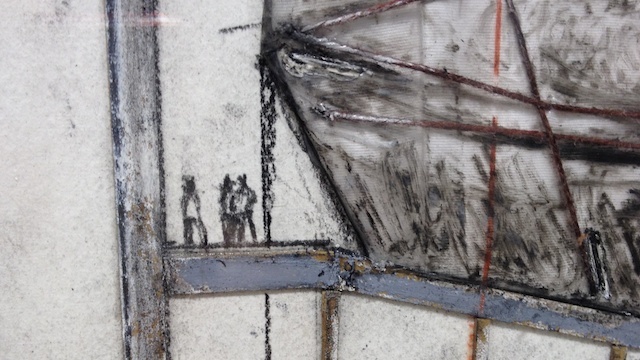 THere’s a real simplicity in his mark-making and incredible vision for how the final piece will look. The way the light works within that vast white space inside the package was so strikingly predicted in his drawings. 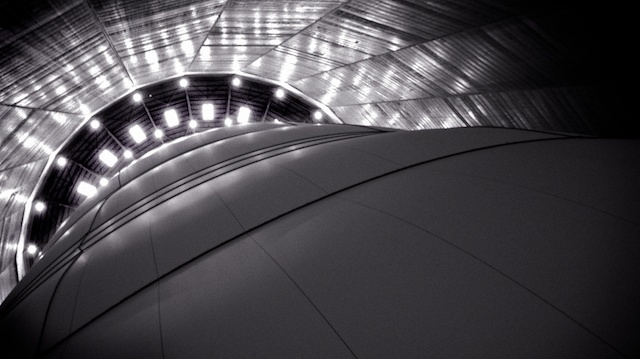 THey’re both illustrations of engineering and things of great beauty in themselves. And so covetable – I could really see how his business plan works. It’s the detail you get from a great work of classical music when you get to play in it. Listening to a performance or a recording is one thing. There’s that whole audio experience and where that takes you. But playing in one you get to see how it’s all made – the engineering bits that hold it together. When I was doing my ‘O’ level music, the only thing I learnt, that I didn’t know before, was that Tchaikovsky was a raving queen who married an nymphomaniac. Emotional torment doesn’t even come close. It’s funny considering the current political stance in Russia that the writer of so much patriotic Russian music was gay. Don’t tell Putin. Shhh! For me personally, Tchaikovsky’s 6th symphony is one of the most beautiful pieces of music ever written. First performed just nine days before his death, it’s the pinnacle of his musical career. Although still in a traditional four movements, Tchaikovsky starts to twist the order of things. Before then the last movement was the big rousing finale – think Ode to Joy in Beethoven’s 9th, or the big tunes in Dvorak’s 9th. But for Tchaikovsky, the big rousing finale march comes in the third movement. He follows that up with one of the most incredible emotional bits of scoring in the forth. A big epic sweeping strings thing that just tears at the heart. The end, just a rumbling fade that leaves you exhausted. Playing in the piece you get to see how he did it all. Tchaikovsky uses a lot of doubling up on tunes – with a number of different instruments playing the same thing, which detracts from the distinctiveness of individual instruments and creates entirely new palettes. Within these he plays around with the mix passing melodies and phrases across the mix, so as a listener you’re not entirely sure what instruments are playing what, it’s just a complete sound. However, the bit that’s long fascinated me is the very start of that final movement. It starts with a soaring, emotional melody – the kind of thing that inspired a million film soundtracks. However, no one actually plays the notes you hear. The first and second violins have slow, leaping parts but your ear picks out a distinct melody from the two. How he ever worked out how that happens, I’ll never know. For me it’s just the epitome of his genius. Today marks the 120th anniversary of the first performance of Tchaikovsky’s 6th Symphony and his last performance. I’m a big fan of Christo’s work and Tchaikovsky, although in many circles there’s a bit of snobbery that dismisses them both. For Christo he’s often dismissed as just pure spectacle with no substance. To many Tchaikovsky is ‘just ballet music’. Maybe it’s because of their accessibility that gets viewed as populist (as if that’s a bad thing anyway). What they both have in common is a desire for creating things of beauty. The art-world seems to have a problem with aesthetics – that things can be made just to be beautiful. Tchaikovsky was unapologetic in his desire to make music that was elegant, emotional and beautiful. 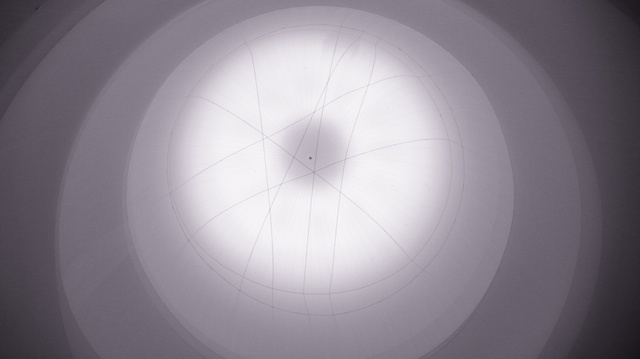 ‘Big Air Package’, like all of Christo’s other work, doesn’t do anything else – it doesn’t move, or change colour or say anything about the place or materials, or the artists even. It’s just a thing of beauty – and that’s it. But it’s beauty done really well.